If you are trying for a perfectly clean window, a stack of lint free, cotton towels are a necessity. These are NOT like your common bath or hand towels. You are looking for a “flat” towel, not one with “loop” or “pile” weaves. Some thin dish towels have a flat weave that will work for windows. The reason to be specific about your towel weave is that if you use a “bumpy” cotton towel, it will leave streaks of lint on your windows when you wipe the edges. 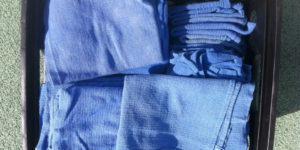 We use blue surgical towels in our day-to-day work. They provide excellent absorbency while being nearly lint free. Also becoming more common with professional window cleaning companies are synthetic, microfiber towels because they last through a lot of cleanings and are virtually lint free.